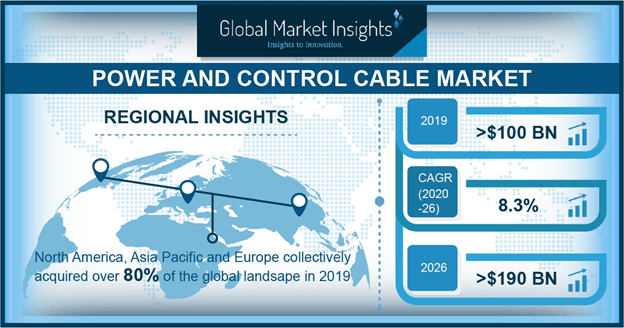 Taking into account the product landscape, power and control cable market primarily comprises control cables and power cables. Power cable dominated the product segment by covering more than 80% of the total revenue share in 2016 and will exhibit noticeable growth rate over the coming seven years. The increasing usage of this product for various grid integration and infrastructure projects will generate noticeable revenue. The industrial and utility sectors are the prominent applications of power and control cable market. Industrial application segment is anticipated to record a CAGR of more than 8% over the years ahead. Growing industrialization along with the surging requirement for electricity will augment the industry growth. The utility application will surpass a revenue collection of USD 90 billion by 2024, owing to the surging installation of low voltage distribution substation to fulfill the energy requirement. Based on the voltage, power and control cable market is mainly divided into low voltage (LV), medium voltage (MV), and high voltage (HV). Low voltage power and control cable market is slated to register an annual growth rate of more than 9% over the period of 2017 to 2024. The prominent usage of this product across the small-scale manufacturing units and the residential sector will fuel the demand for the product notably. Shifting trends toward the adoption of renewable energy to fulfill the huge requirement of electricity will also impact power and control cable market size significantly. Considering the regional landscape, China power and control cable market covered more than 40% of the revenue share of APAC region in 2016 and will register a noticeable growth rate over the coming seven years. China is investing heavily to expand its electric grid capacity. The State Grid Corporation of China planned to invest USD 350 billion in the expansion and upgradation of their grid infrastructure. In addition to this, the surging requirement of sustainable energy will also influence the regional power and control cable industry share significantly. MEA power and control cable market will exhibit an annual growth rate of more than 7% over the period of 2017 to 2024. The growth can be attributed to the escalating investments in the renovation activities across the war affected regions such as Syria. U.S. power and control cable industry size is predicted to record a CAGR of more than 6% over the coming years of 2017 to 2024. High investments in UHV and EHV network development will stimulate the product demand considerably. Moreover, implementation of regulations regarding the replacement of old electric boards and systems along with the development of micro-grids will propel power and control cable market size. The noteworthy business players in power and control cable market are Nexans, LS Cable & System, The Furukawa Electric Co., Ltd., Prysmian Group, General Cable, Polycab, Sumitomo Electric Industries, Havells, Southwire, and CMI Limited. This entry was posted in ENERGY, MINING, OIL AND GAS and tagged Control Cable market, Power and Control Cable, Power and Control Cable market, Power and Control Cable market Analysis, Power and Control Cable market forecast, Power and Control Cable market Growth, Power and Control Cable market Outlook, Power and Control Cable market Price, Power and Control Cable market Share, Power and Control Cable market Size, Power and Control Cable market trends, Power market. Upstream application in oil and gas analytics industry was worth USD 2 billion in 2015 and will register a noticeable growth rate of more than 20% over the coming seven years, owing to the growing prevalence of unconventional and offshore drilling activities. Of late, companies have been implementing analytics tools to find out real-time data at minimized cost. TIBCO company has adopted this technology to optimize their production and exploration costs. Other key players sharing the oil and gas analytics market space are Cognizant, Accenture, Oracle, Teradata, Capgemini, Drilling Info Inc., Hitachi, Ltd., Tableau Software, Microsoft, Cisco Systems, Inc., Hewlett Packard Enterprise Development LP, SAP SE, and IBM. Hosted deployment mode will record a significant annual growth rate of more than 20% over the coming years of 2016 to 2024. This deployment mode exhibits superior productivity, improved capability, and is highly cost effective compared to its counterpart, the on-premise deployment mode, which generated a revenue of USD 1,787 in 2015. 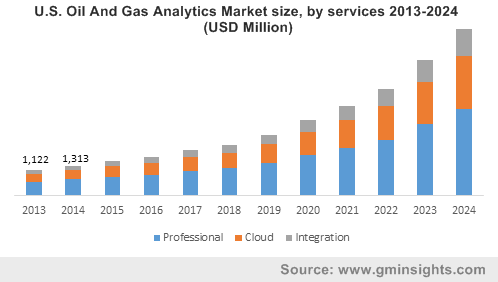 Oil and gas analytics market players implement professional, cloud-based, and integration analytics services to obtain real time information. Oil and gas analytics market from cloud-based services will record an annual growth rate of more than 21% over the coming seven years. This growth can be attributed to increasing demand for cloud infrastructure. Oil and gas analytics industry from midstream applications, having accounted for more than 21% of the overall share, will generate a considerable revenue by 2024, primarily driven by surging product demand from midstream applications. Pipeline SCADA, one of the sub-segments categorized under midstream applications, is predicted to surpass a revenue collection of USD 2 billion by 2024. The surging need to extract accurate and real-time information will propel oil and gas analytics market growth from pipeline SCADA applications. Considering the regional trends, India oil and gas analytics market will record substantial growth rate over the year ahead. The growth can be attributed to the growing number of refineries. In addition to this, most of the industry giants across this region are expanding their production capacity, which will influence oil and gas analytics industry growth. For instance, the Indian Oil Corporation is planning to invest USD 2.3 billion to expand refinery capacities to 25 million metric tons per year. U.S. oil and gas analytics industry size generated a revenue of USD 1 billion in 2015 and is anticipated to record an annual growth rate of more than 19% over the period of 2016 to 2024. Escalating shale gas exploration activities in the region along with surging efforts to increase the overall production capacity will augment the product demand. In Europe, Norway oil and gas analytics market, having had a revenue of USD 286 million in 2015 will exhibit a CAGR of more than 19% over the coming years of 2016 to 2024, owing to the growing adoption of digital technology across this region. The usage of digital technology will positively impact the oil and gas analytics market, subject to the reduced production and operational costs. Oil and gas analytics is basically a tool that is used to analyze big data and provide actionable insights for the upstream, midstream, and downstream applications. Huge corporations are striving to introduce technological advancements in this tool to improve its efficiency and performance. For instance, Deloitte has developed novel oil & gas analytics solutions that work much faster than the conventional solutions and can even support data flow architectures using emerging data types. This entry was posted in ENERGY, MINING, OIL AND GAS and tagged oil and gas analytics, oil and gas analytics market, oil and gas analytics market Analysis, oil and gas analytics market forecast, oil and gas analytics market outlook, oil and gas analytics market pdf, oil and gas analytics market price, oil and gas analytics market report, oil and gas analytics market share, oil and gas analytics market size, oil and gas analytics market trends. 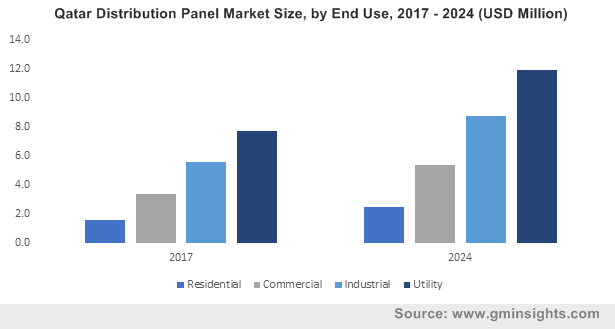 The growing demand for panel boards across the telecom & power generation sectors will act as a major driving force for Middle East distribution panel market. Being vital components of a power supply system, these boards provide a protective circuit breaker for every circuit enclosed in the service panel enclosure, from where the utility power is distributed to different branch circuits. Powered by the rising need to reduce electricity wastage and optimize power consumption, in conjunction with the enforcement of renewable energy norms, Middle East distribution panel market is likely to chart out a lucrative growth graph ahead. The recent trend of switching over to renewable energy sources such as solar and wind energy has also prompted companies to innovate a variety of distribution panels designed to be adaptable for myriad applications for electricity generation via sustainable resources. Prominent companies partaking in Middle East distribution panel industry share are also concentrating on developing unique technologies to be incorporated in distribution panels for them to be utilized in solar panels and eco-friendly electric devices, thus contributing to the revenue generation of this regional market. A report by Global Market Insights, Inc., claims the Middle East distribution panel market size to have registered a revenue of USD 250 million in 2017. The dire need to fulfill the ever-growing demands of electricity across countries such as the United Arab Emirates, Oman, Saudi Arabia, Kuwait, and Qatar will positively influence Middle East distribution panel industry growth. It should be remembered however that this market is strictly defined by a regulatory framework. For instance, the Qatar General Electricity & Water Corporation (KAHRAMAA) has declared that any work pertaining to electrical installation needs to be carried out only by licensed contractors. The United Arab Emirates has experienced an onslaught of construction projects in the recent years. Merely a few weeks ago, the UAE government held talks with China State Construction Engineering Corporation Middle East (CSCEC ME) in order to collaborate on infrastructure projects. That said, the region is also experiencing an increase in the per capita income of the population. Driven by increasing disposable incomes, added affordability, the shifting trends toward renewable sources coupled with the demand for uninterrupted power supply, Middle East distribution panel market is likely to accumulate commendable proceeds from the UAE. Indeed, as per estimates, Middle East distribution panel industry share from the UAE is anticipated to register a CAGR of 5% over 2018-2024, powered by the rising adoption of sustainable electric products and the development of an advanced grid network across the region. 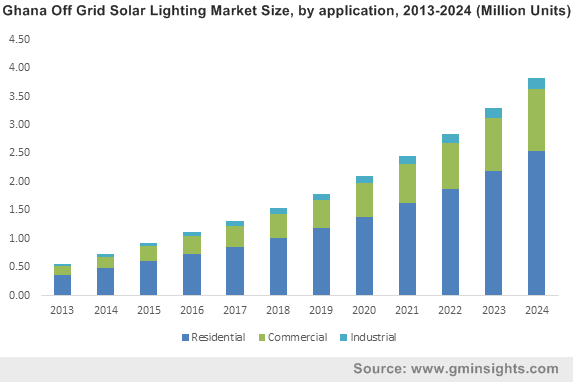 Reduced dependency on fossil fuels coupled with the incorporation of advanced technologies in efficient energy generation will drive Middle East distribution panel market. The region has also been demanding clean energy on a large scale, which in tandem with improvised production efficiency will act as a major driver for the regional industry. Developing new product types that can be used for numerous applications has become a key strategy of players in Middle East distribution panel market. For instance, recently, ABB Ltd. launched the SafeT™ panelboard that offers great flexibility and safety. Embedded with plug-in devices and a safe bus stack, this distribution panel uses Tmax molded case circuit breakers that are designed to hold 30% lesser mounting space. This apparently facilitates a reduction in the space occupied by the panel enclosure. Aided by the efforts put in by regional companies toward augmenting the demand for distribution panels through the development of a range of varied boards suitable for many applications, Middle East distribution panel industry is likely to carve out a positive growth graph in the ensuing years. As per reliable estimates, Middle East distribution panel market size is forecast to cross USD 440 million by 2024. This entry was posted in ENERGY, MINING, OIL AND GAS and tagged control panel, distribution board, distribution panel, distribution panel market, electrical distribution panel, Middle East distribution panel, Middle East distribution panel market, Middle East distribution panel market analysis, Middle East distribution panel market forecast, Middle East distribution panel market outlook, Middle East distribution panel market pdf, Middle East distribution panel market report, Middle East distribution panel market Share, Middle East distribution panel market Size, Middle East distribution panel market Trends, panel Board, power distribution panel. The prominent application areas of hydraulic cylinder industry are industrial and mobile. Industrial application segment accounted for more than 32% of the revenue share in 2015 and will exhibit a CAGR of above 4% over the coming eight years. 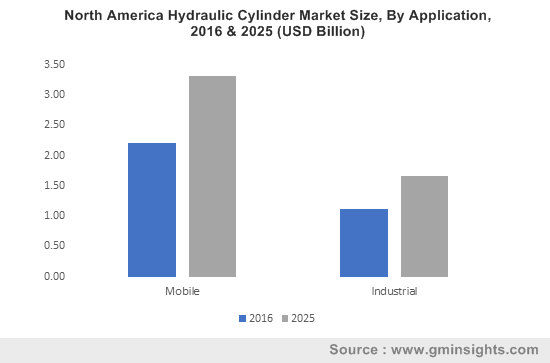 Mobile hydraulic cylinder industry dominated the application landscape in 2015 and will generate significant revenue over the years ahead, owing to the increasing product requirement for material handling and agricultural equipment. Additionally, escalating urbanization and increasing construction activities will augment the industry. Based on the product, hydraulic cylinder market is mainly divided into welded and tie rod. Welded hydraulic cylinder industry will surpass a revenue collection of USD 11 billion by 2025. The extensive use of this product in the construction, mining, industrial, and material handling sectors will augment the market growth noticeably. The surging expansion of the agricultural equipment industry will propel the demand for tie rods, which will grow at an annual growth rate of more than 6% over the period of 2016 to 2025. Double acting and single acting are the main functional trends of hydraulic cylinder industry. Double acting hydraulic cylinder will collect a revenue above USD 11 billion by 2025, primarily due to the usage of double acting hydraulic cylinders in applications where gravity is the prominent factor, affecting the acceleration and retardation. In addition, double acting function based hydraulic cylinders are extensively used for heavy trucks, forklifting, and earth moving equipment, which will considerably drive overall hydraulic cylinder market share. Single acting hydraulic cylinder market was worth USD 3.12 billion in 2015 and will record substantial growth rate over the coming timeframe. Geographically, U.S. hydraulic cylinder industry is predicted to generate a revenue of more than USD 3 billion by 2025, owing to heavy investments in the material handling, defense, and aerospace sectors. China hydraulic cylinder market will collect a revenue of more than USD 1 billion by 2025. The growth can be attributed to the increasing expenditure in infrastructure development. In the years ahead, the Chinese government is willing to invest around USD 151 million in Hubei Xiaogan logistics infrastructure project. Brazil hydraulic cylinder industry will exhibit an annual growth rate of more than 4% over the period of 2016 to 2025, primarily driven by rising investments in the transportation sector. Russia hydraulic cylinder market will also register a CAGR of more than 3% over the coming eight years. The growth can be attributed to the surging requirement of construction and agricultural equipment. The key participants in hydraulic cylinder market are Bosch Rexroth AG, Wipro Infrastructure Engineering, Aggressive Inc, Hannon LLC, Best Metal Products, Ligon Industries, LLC, Eaton Corporation PLC, Prince Manufacturing Corporation, Hydrapac Italia, YELETSGIDROAGREGAT, chapel hydraulique, United Hydraulics, Burnside Autocyl (Tullow) Ltd., Bailey International LLC, Enerpac Corp., Baltic, Hyco International, Inc., Caterpillar Inc., Precision group Inc., Norrhydro Oy, Parker-Hannifin Corporation, Weber-Hydraulik Group, Pacoma GmbH, Texas Inc, and Hydrosila. This entry was posted in ENERGY, ENERGY, MINING, OIL AND GAS and tagged Hydeaulic Cylinder, Hydeaulic Cylinder Market, Hydeaulic Cylinder Market Data, Hydeaulic Cylinder Market Outlook, Hydeaulic Cylinder Market PDF, Hydeaulic Cylinder Market Price, Hydeaulic Cylinder Market Report, Hydeaulic Cylinder Market Share, Hydeaulic Cylinder Market Size. The increasing importance imparted to effective electricity distribution has been a major factor driving circuit breaker market size. That is to say, presently, if electricity supply experiences a letdown even for a day, the functioning of numerous commercial and industrial establishments comes to a standstill. The rising occurrence of workplace accidents at the power generation facilities and commercial industries due to the failure of electricity distribution systems has also raised importance for the use of circuit breakers. In this regard, the organizations like the Occupational Safety and Health Administration (OSHA) have also been deploying strict regulatory norms to improve the safety of employees at the workplace. In order to comply with a stringent regulatory scenario, most of the companies have heavily deployed circuit breakers that has impacted the product demand. Taking into account the surging demand for circuit breakers from several commercial and industrial end-users, the players in the circuit breaker market have been focusing on the development of circuit breaking devices which are suitable for particular applications. For instance, recently, ABB has developed circuit breaking devices that can be suitable for all voltages and applications with a rated current between 160 A to 1600 A. It also integrates the features like wireless connection that helps simplify the commissioning and installation of devices. Another circuit breaker industry contender, Schneider Electric has also invented a newer version of circuit breakers which allow for smartphone connectivity. Through the smartphone connectivity feature, the company can carry out maintenance work rather efficiently. As the world is moving toward the large-scale adoption of digitalized, electric, decarbonized, connected, and decentralized facilities, the advent of such smart products is becoming more popular. In addition to the development of next-generation products, Schneider has been incorporating new standards in air circuit breakers to improve the product’s capability to withstand short-circuits, overloads, and installation faults. Armed with a consistently developing product portfolio, companies have been striving to gain an edge in circuit breaker market. The introduction of new regulations along with the growing awareness among regulatory bodies about the failure of power distribution systems and its hazardous implications on the users has significantly transformed circuit breaker industry trends over the last few years. Regulatory bodies like OSHA have raised concern about the danger of arc flash which particularly occurs in industries and power sensitive environments where 125kVA and larger transformers are being used. The healthcare facilities like hospitals, large clinical laboratories have deployed these transformers on a large scale which is remarkably fueling the need for the deployment of arc flash prevention devices. The effective use of arc flash preventers and the presence of a strict regulatory spectrum have had a positive impact on the circuit breaker industry share. The product demand from heavy industrial sectors like mining and construction have also imparted a considerable influence on the industry trends. In the mining industry, circuit breakers have been used in an environment where combustible gases are present. Circuit breakers are also used in the underground mining equipment to maintain safety while feeding electric power. 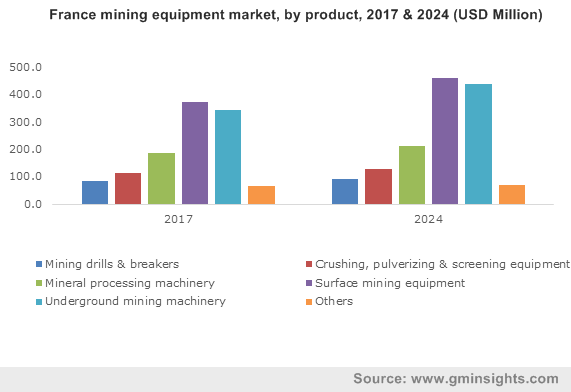 The primary use of circuit breakers in the mining equipment for offering economic and safer load connections between an electric source and underground mining equipment is poised to augment the market size over the years ahead. 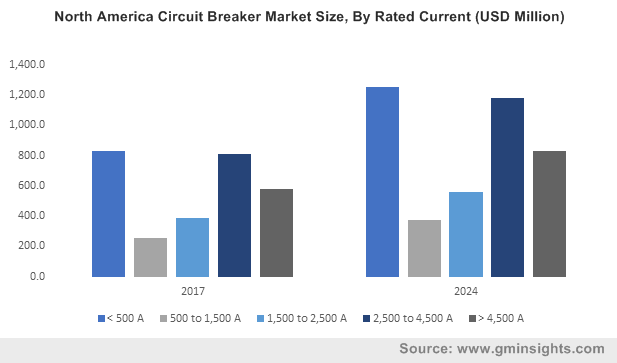 The innovation brought about in product development and the numerous R&D activities of electronic companies will have a remarkable impact on the future business trends in the circuit breaker market. In order to strengthen the market position in the strict regulatory scenario, companies have been setting newer standards to meet consumers’ demand. The emergence of new technologies will further generate lucrative opportunities for the industry contenders. For the record, by the end of 2024, circuit breaker market will surpass a revenue collection of USD 21 billion. This entry was posted in ENERGY, MINING, OIL AND GAS and tagged Breakers, Circuit Breakers, Circuit Breakers Market, Circuit Breakers Market Analysis, Circuit Breakers Market Outlook, Circuit Breakers Market PDF, Circuit Breakers Market Price, Circuit Breakers Market Report, Circuit Breakers Market Share, Circuit Breakers Market Trends, electrical Breakers, Fuses.